In addition to working with artisans, I always like to get to know my vendors. My feature today is with Zeina from Zenia’s Chocolate Boutique who will be at the Art World Expo Christmas Fair on Saturday, December 16! Zeina ‘s Chocolate Boutique specializes in decorating fine chocolates with a creative elegance. All chocolates are custom made with Belgian chocolate . With a variety of designs and idea to choose from, we are certain that will make that special day of your absolute. At Zeina’s Chocolate boutique our main intention is to design Unique and perfectly wrapped chocolate decorated with high quality elements using the finest ribbons and the best brand of chocolate that taste exceptional and looks great . Chocolate favors are a unique fun and thoughtful choice. Everyone loves chocolate and we are sure you will be delighted with the quality and intense chocolate flavor of our chocolates, truffle boxes. Chocolate is the first luxury. It has so many things wrapped up in it: Deliciousness in the moment, childhood memories, and the grin inducing feeling of getting a reward for being good. How did you get involved in the chocolate business? I got the idea from when I was visiting the Middle East where it is very popular business to decorate chocolate. What are your favourite things to make for clients? My favourite part is creating unique decorated pieces-from chocolate favours, center pieces, strawberry and macaroon towers to dessert tables. What products and services does Zenia’s Chocolate Boutique offer? I offer decorated chocolate, chocolate favours, cake, cupcakes, strawberry and macaroon towers and unique desserts. What are your business goals in the next 5 years? I am hoping in 3-5 years to be the # 1 online dessert website in Vancouver. Yes, there are a lot of stores that offer desserts but I would like to be best mobile dessert business in town! I would like my clients to know that Zeina’s Chocolate Boutique is the unique best dessert business online! Visit Zeina’s Chocolate Boutique at our Christmas Fair on Saturday, December 16 and try some of these delicious works of art! To have a look at all the products she offers, please see Zeina’s website! One of the hardest things artists struggle with is finding inspiration. We have no shortage of ideas that come to us, but actually finding inspiration for individual pieces or collections can be tricky! This is even more true when you experience a creative block-nothing’s coming! Having spend the last two weeks abroad on tour with our annual artist retreats, Painting Dreams International Art Tours, I have thought about inspiration quite a lot. Being in a new place has not only inspired me to make new and entirely different work, but has also opened up my palette for a thirst for something more in art and creativity. I thought I would share my top three tips for finding inspiration with you while sitting in our city apartment on a Sunday evening in Wroclaw, Poland. Feel free to try them out, share and connect with me on social media and share what you’re doing to find inspiration! We all know that stepping away from your day to day routine can spark an enormous amount of insight, creativity and inspiration. Each time I travel, I make sure to document my surroundings carefully as I always find some kind of spark of intrigue in the things around me when I create paintings especially. In our suite this year, I have been delighted to see antique furniture and items that are engaging in my curiosities. I haven’t painted any of these items yet, but have taken pictures so that I don’t forget and can incorporate them into my art later perhaps. My room where I’ve been writing and sharing my trip, art and visits to galleries. Below are some of the cool pieces in this suite. Another thing to remember when looking for ways to find new inspiration is to challenge yourself. If you’ve always painted flowers, try buildings or landscapes. If you’ve always made abstracts, try doing a portrait or a plein air painting outside at a local park. You don’t have to travel far to try new things! It’s just about the conscious effort of finding new items, people, or local things to draw on for inspiration for new work. I also recommend trying new products. Recently, I worked on the two paintings on cedar blocks below with beeswax, fabric, pearls, paint, pages from “The Winter’s Tale” by Shakespeare too! I added word cut outs from magazines and even dried leaves! These are the two pieces that were definitely outside my norm. Both are available for purchase. $150/each or $250 for the set. Check out this Google Doodle by 11 year old Audrey Azhang, the 2014 Doodle 4 Google winner. In response to the question, “What would you invent to make the world a better place?” more than100,000 Google Doodle contest entries were received from students in grades K – 12. To make the world a better place, I invented a transformative water purifier. It takes in dirty and polluted water from rivers, lakes, and even oceans, then massively transforms the water into clean, safe and sanitary water, when humans and animals drink this water, they will live a healthier life. Don’t forget to like my page on Facebook and connect with me on Twitter! I share lots of daily tips, progress and love to hear from artists all over the world about their work! 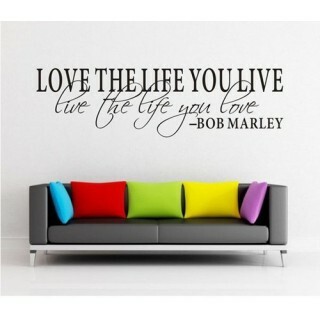 Be inspired with this wall quote that will remind you every day to pursue your dreams and passion. At Art World Expo, we love to promote businesses and artists who are doing just that with their lives. Check out Wall Sticker Shop for some great wall stickers, thousands to choose from, that will keep you motivated and inspired! 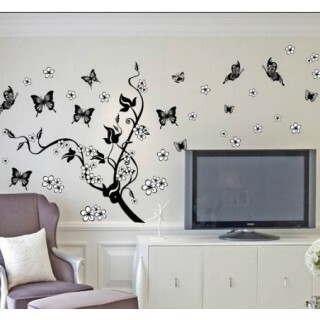 Have a look at their site http://www.wallstickersshop.co.uk/ for some fab finds that will bring some life to your home! 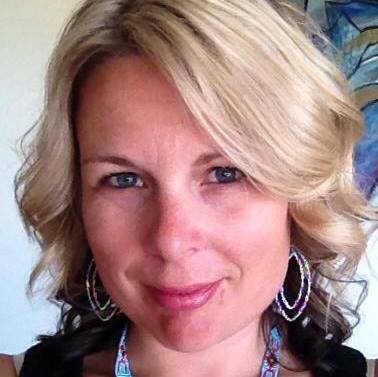 About: After returning to her home town of Vancouver after 14 years, Cristina Petersen now works as a painter and ESL instructor at the University of British Columbia. 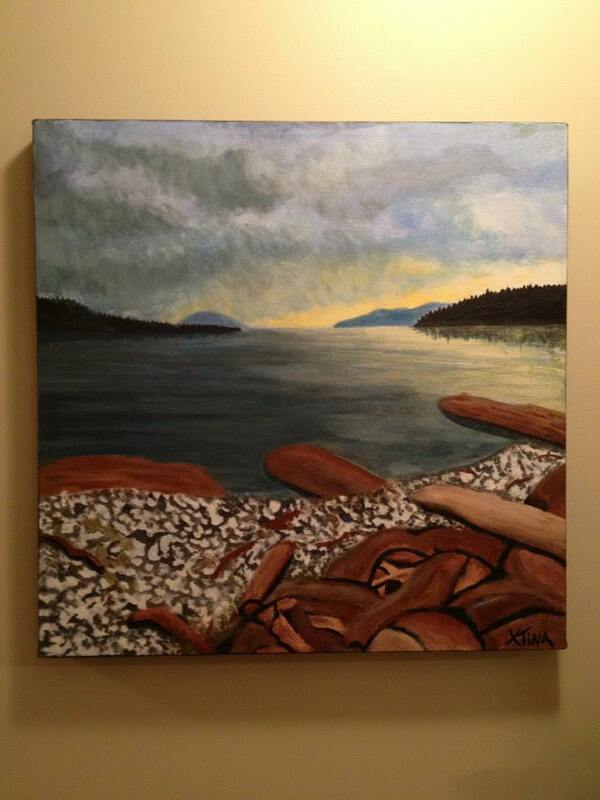 She is new to showing her work, and looks forward to developing and improving as an artist. As a newcomer to the Art World Expo, what are you expecting? I am expecting to talk and connect with a lot of like-minded people, and to have fun being involved in such a great and vibrant event! I hope to sell some work, but I think that just being there is a step towards even considering myself as a real artist. You are new to showing your art. How did you decide to do that, and what was your experience like? I was encouraged by Monika to do more art and to get it out there, but also met a local artist in my neighbourhood named Marty Andaluz. I worked with him to have my first art show, along with two of my friends, who are also new to art. We had fun organizing it together at a local café, Room for Cream on Kingsway. It also helped to have encouragement from my fiancé, Tom, as well as family and friends who support this new adventure of mine. You’re juggling two jobs – as an artist, of course, but also as an instructor at UBC! What is that like for you? It’s very difficult to find time sometimes to paint, as teaching is a very demanding job. 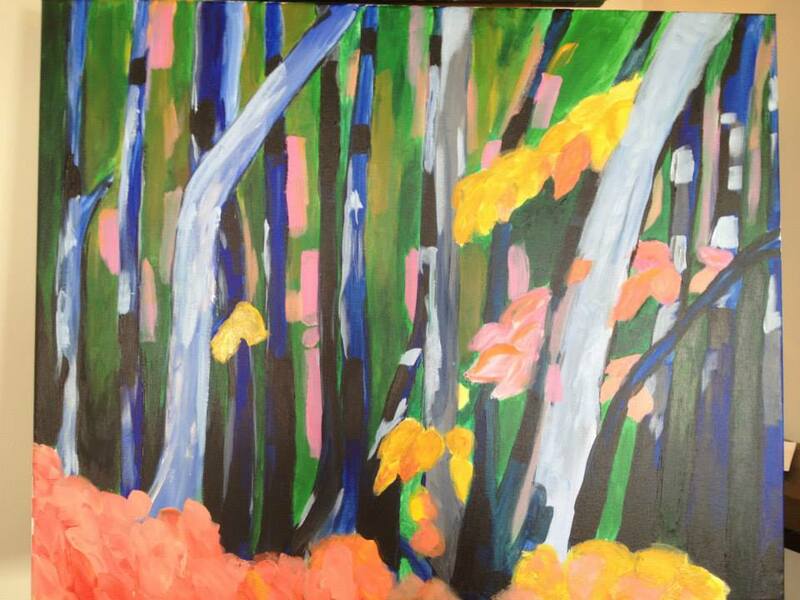 I love teaching and it is my priority of course, but I try to paint on weekends or when I feel inspired. You’ve mentioned that you love to write. What do you enjoy writing? Have you ever considered this as a career? I like to write blogs sometimes for my work. They are about teaching. Writing is just a fun way to express myself about things I’m passionate about. I have toyed with the idea of going into editing as I have a keen eye for errors, having taught ESL for about 13 years now. But ultimately, I am very social and think that being a writer might be too isolated for me…perhaps something later in life! I am always open to trying new things. Do you think being in Ecuador will be an artistic inspiration for you? Yes of course, traveling is always an inspiration. New experiences are what keep things fresh. How has working as an artist affected your work as an instructor, and vice versa? I am not sure that it has affected my work as an instructor, but sometimes I feel like teaching language is a very creative job. When I am in the classroom, I can create a mood or focus on certain things, much like painting. Although with my job, there are administrative duties that sometimes zap my creative side and make me wish I were just able to paint! I teach English as an additional language. I teach in different programs all the time, so sometimes I teach in the Intensive English Program, (IEP) or the English for Academic Purposes (EAP), the English for the Global Citizen (EGC) or Explore (with French Canadians). I teach all the skills, but if teaching IEP or EAP I usually try to pick the Speaking and Listening classes or writing courses. I like teaching Speaking because I like to facilitate discussions, teach presentation skills etc. Writing essays is a bit of an art form too. I have always loved to write as well. You work in acrylics. What makes you choose it? Mostly because they are forgiving and easy to clean, as I usually paint in my apartment, so I have to set up everything and take it all down at the end. Cleaning brushes etc. is way easier. I also like to add water or Gesso, sometimes crackle paste for variety as they mix well. I can add oil on top if I want more texture later. Things or people? *laughs* My fiancé, my family, my friends, my dog… but aside from that, being a given, I love horseback riding and skiing; those are the two hobbies that I am passionate about. I try to stay healthy by exercising and eating healthy, delicious food. I enjoy a good glass of red wine, living a simple life, and travelling when I can to explore the world – particularly foreign places where I don’t speak the language. I’ve been studying Spanish off an on for about 10 years. Do you have any significant goals for the future? Well, I am getting married next June, so my fiancé and I are planning our wedding. We are saving money right now and also hoping to take our honeymoon in Ecuador. Hopefully sell more art to help fundraise. Can you think of a particular moment or person that inspired you to become an artist? 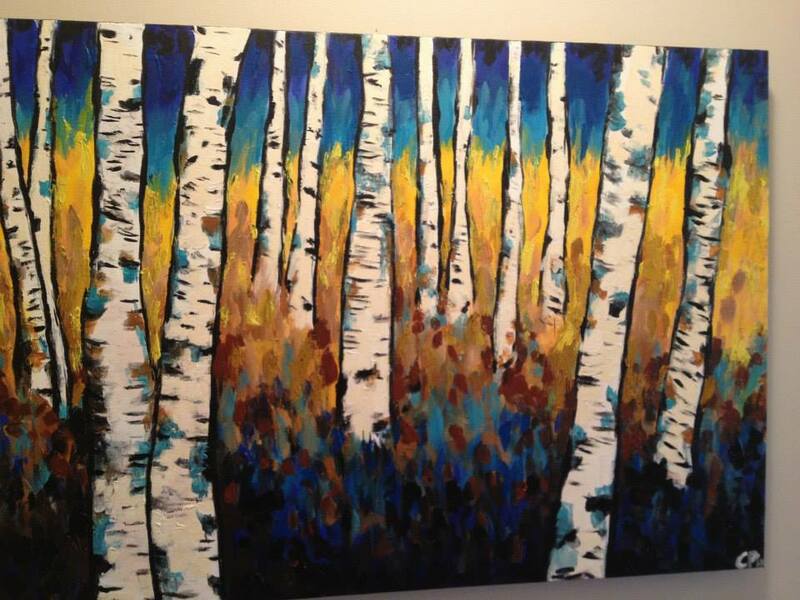 My half-sister Dana loves to paint and is really quite talented. I think she will surpass my skills! I bought her a painting lesson almost 3 years ago with Monika and went with her. This was my first painting lesson too, and ever since then, with Monika’s encouragement, I have kept painting. I have always loved art and art galleries too. I think it was always in me, but it was a matter of being in the right head space to pull it out. And to have that initial “ah ha!” moment, like “Wow, that was really fun, I want to do more of that!” Now I am older and have found my path as an instructor, so I feel like expanding my horizons and trying new things. Learn new skills. Be creative. Always grow as a person. Do you find that, on a bad day, painting can make you feel better? Yes, of course. It is very calming and therapeutic. You can lose yourself in the art and not worry about anything else. Although I have to tell myself sometimes not to be a perfectionist. I like to paint with bigger brush strokes and more abstract style on days where I need a release. Is there a specific technique that you like to use or find interesting? I love work by Dali, it’s so weird and crazy, as well as work by the Group of Seven. I really like abstract scenery and more free flowing brush strokes. Not really schooled in art, so not sure of any specific techniques, but I know I am still experimenting and learning a lot. How do you hope to improve as an artist? I hope to improve my ability to draw or paint specific features like eyes, noses and mouths. I also hope to let go of my own criticism of my own work. I have to accept that not all pieces turn out quite how I envision them, but sometimes that is the beauty of it.